Stitched with prayer is the winner of the carrie Nelson book from yesterday’s post. Hey it’s me and I am making 2 posts in a row. Imagine that! Today I am sharing a brand new book published by Kansas City Star. The authors are good friends of mine and happen to be moda designers. Their style is classic and timeless. I think they are the female version of Ralph Lauren. Patriotic quilt and hooked rugs from the WWII era. An exerpt from the dedication page of this book. Victory Girls is intended to serve as a testimonal to the women who supported World War II on the homefront through sacrifice, service and selfless dedication to the war effort. This is a giveaway for the Polly and Laurie Fan club. You know who you are. Tell me why you must have this book. You must have a way for me to contact you via e-mail. This will be short and sweet. I will draw the name by 6:00 am tomorrow morning. (Thursday) A 24 hour giveaway.! Go for it and thanks for stopping by. 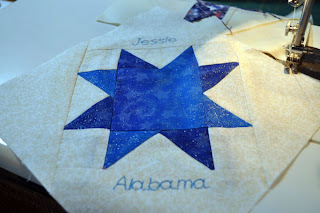 their block for the JUST ONE STAR project. I had the honor to start sewing some of the blocks together into quilt tops. I joined the blocks into rows of 6 chain piecing them as I went along. I have been quilt for 30 years and I continue to learn or RE-LEARN things. 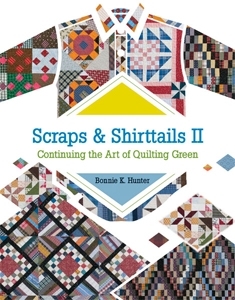 I recently attended a quilt guild meeting where Bonnie Hunter was the speaker. It was so good I went to another guild meeting 2 nights later. Bonnie has won the award for making the most fantastic quilts from scraps, leftovers and recycled, re purposed fabrics. Bonnie’s blog, Quiltville is a must read. Bonnie’s book, Leaders and Enders, published by Kansas City Star is amazing. This is the part where I re-learned. Bonnie wrote an entire book that utilizes Leaders and Enders. The picture above shows what a leader is. 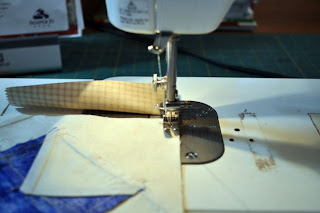 Basically a piece of fabric to begin sewing on, before you start chain piecing your blocks together. The leader does a couple of things. 1. It keeps your needle from coming un threaded. 2. It makes you not have those long pieces of thread to trim away. The bonus thing it does is you can actually sew an entire separate project just by using leaders and enders. You may remember my candy bar post from 2 days ago. I am making the dresden plate sections as my leaders and enders while I assemble Just One Star quilt tops. Here is my ender (another dresden plate fan section) To make an ENDER sew half way and stop. 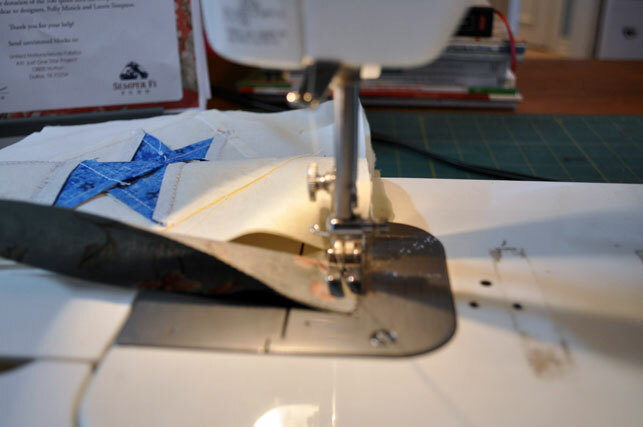 Cut off the sections that you have chain pieced. 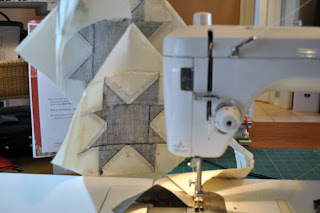 Your ENDER now becomes your LEADER and you are ready to start chain piecing the next section. I love my auriful thread and using the LEADERS and ENDERS saves thread. I never thought I needed to use a leader or ender. I didn’t have much trouble with my needle coming un threaded BUT I did hate trimming those excess threads. The back of my projects looks so much neater. Did I forget to mention that I got Bonnie to autograph 2 of the books while she was in town? AND I am giving them away here. and post the winners on April 7th.